FTC disclaimer: I received a free copy of this book from the publisher in exchange for a fair and honesty review. 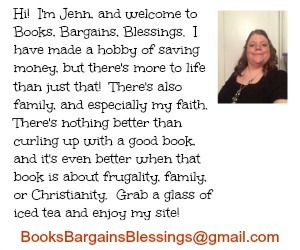 Family Christian generously offered a $25 Appreciation Certificate to one of my readers since they sell this book. I received no other compensation. This post does contain affiliate links. I remember the first time I stumbled on Ruth Soukup's blog. When she began her blog, she was a shopaholic looking to be able to buy the same items she'd been accustomed to buying but at a discount. I saw the word "luxury" in the blog's tagline and a quick glance around and I backed out. I was looking for a site where I could find bargains out of necessity -- not out of wanting the best life had to offer on a dime. My mother had recently gone on dialysis and needed a new bed. I gave my mother my bed and took an old futon and after it broke I slept on the floor for a while. I was looking for bargains I needed, not for throw pillows or fashionable boots. From then on, I always thought "There's that one blog that isn't relevant to me." Over the years, I never went back to notice the change. But it happened. 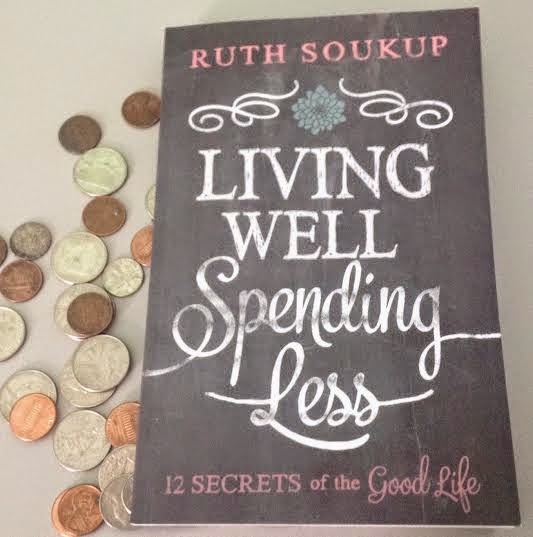 I was given the opportunity to review a copy of Living Well, Spending Less: 12 Secrets of the Good Life . Since I started my blog to document my frugal ways, this is a topic that always interests me. It was not until I was reading this book before I realized this was written by the "luxury" blog woman. But -- I've visited it since. When you visit blogs about frugality, you often visit the big ones, I just never connected her current blog with the old one. She documents how this change came about in the first part of her book. My mother always told me there are always people worse off than us. I was recently talking to a friend about my upcoming wedding and how I'm doing it on a shoestring. I commented how it seemed almost wrong for me to spend too much because of how many people there are in the world who are in need. I doubt that thought crosses anyone's mind when planning a wedding. I thoroughly enjoyed the first part of her book. Even for a seasoned frugal shopper like me, this part was very much worth my time because I loved reading about her transformation when it came to material possessions. Would you believe the lady I used to think of as "The Luxury Deal Blogger" now has a place in my mind as "The Lady Who Took Away all Her Kids' Toys". What happened? She had a change of heart as to needs, and this book details that. The first half of the book talks about just general living well -- time management, goal setting, and how less stuff can make our lives better. The second part of the book is one of the best guides to saving money I have ever read. I am a coupon queen -- have been for over 20 years. But I learned something important one day when I needed some groceries and didn't have my coupons with me -- I still got some amazing bargains without any coupons. I still save about $1500 a year, but that is with minimal time involved, not like it used to be where I would sort coupons for hours and had an elaborate filing system. Once I was asked to teach a coupon class, and I agreed with the caveat that I would teach coupons along side with finding good bargains to save money at the grocery store. I was turned down -- they wanted only coupons to be covered. This book mentions coupons, but gives great ideas on saving money. 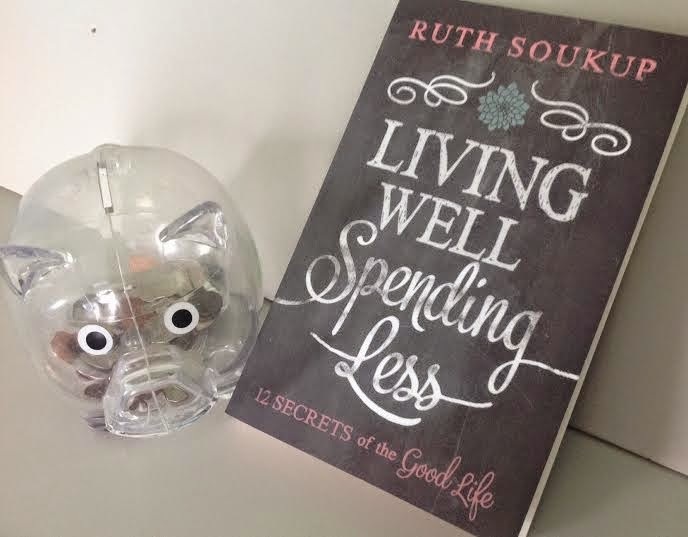 It's a very well balanced frugal book, and I can't recommend it enough. She also mentions savings. Not savings when you spend (which is something I still say -- in fact I just said I saved $1500 last year -- but what is missing is how much I had to spend to save that!) She mentions savings as in for the future. I was told when I was in Kindergarten how expensive college is, and I immediately asked my mother if I could open a saving account. I would deposit all my birthday and Christmas money and before I knew it, I had over $1,000 saved for college -- and I hadn't even hit middle school. I highly agree with her advice on saving for the future in this book. You never know what will happen -- just this month I had a $1,500 repair bill because my water pipes froze then burst! I'm thankful I didn't have to put that on a credit card. Another thing I loved about this book is how she discusses giving. I love to give to others. That's one reason I do use coupons, so I can give food or other items to people in need. Sometimes books on frugality leave out giving to others. This one does not. I highly recommend this book no matter if you're just now starting to pinch those pennies, or if you have a reputation of being frugal. FTC disclaimer: I received a free copy of this book for review from the publisher. Family Christian generously offered to sponsor a giveaway since they sell this book. All opinions are my own and I only recommend products I believe have value. Family Christian sells Living Well, Spending Less: 12 Secrets of the Good Life if you are interested in purchasing it. One reader will win a $25 Family Christian Appreciation Certificate. You may choose this book OR the item(s) of your choice. It works as a coupon code and cannot be combined with other coupons. Open to the USA only, 18 and older. One entrant per household. Giveaway ends 2/2 at 11:59 pm Eastern Time. My best tip is to recycle catalogs without looking at them and stay out of the stores! If I don't see it, I don't want it. Hope the book could help me with managing my finances better! My best tip to live frugally is to make less frequent trips to the stores to avoid impulse buying. I can always use help in this area!! A tip for living frugally is to save all your change you get at the store and keep it in a jar, in a few month, you'll be surprised at the money you have. I'm always looking for ways to save money. My best tip--look for coupons and use a budget! I'd like to read and learn better shopping habits, like how to plan better! I'm always interested in saving money where I won't notice it. For example, I don't want to give up our dinners out, but would like to save a little bit when we do eat at a restaurant! I would buy the Jesus Loves Elephant Blanket Pink for my daughter. One of my tips is to use rebate style apps like Checkout51. It adds up and anything helps. One of my best tips is to keep a ledger and put each day's expenses in it. At the end of the month you can see how much money you might have wasted.